PRICE DROP FROM $24,995, PRICED TO MOVE $2,300 below NADA Retail!, EPA 28 MPG Hwy/22 MPG City! CARFAX 1-Owner. Heated Leather Seats, WHEELS, 19" X 7.5 (48.3 CM X 19.1 CM) MACHINED ALUMINUM, Turbo Charged Engine, Back-Up Camera SEE MORE! 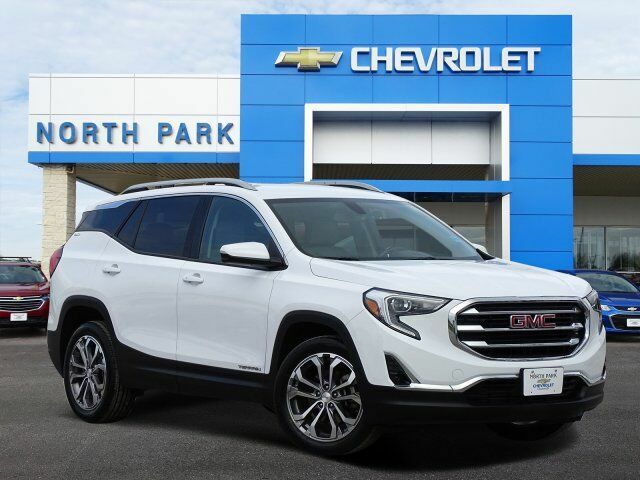 Leather Seats, Heated Driver Seat, Back-Up Camera GMC SLT with SUMMIT WHITE exterior and MEDIUM ASH GRAY / JET BLACK interior features a 4 Cylinder Engine with 252 HP at 5500 RPM*. ENGINE, 2.0L TURBO, 4-CYLINDER, SIDI, VVT (252 hp [188.0 kW] @ 5500 rpm, 260 lb-ft of torque [353.0 N-m] @ 2500 - 4500 rpm), WHEELS, 19" X 7.5 (48.3 CM X 19.1 CM) MACHINED ALUMINUM with Gray painted accents, AUDIO SYSTEM, 8" DIAGONAL GMC INFOTAINMENT SYSTEM includes multi-touch display, AM/FM/SiriusXM stereo, Bluetooth streaming audio for music and most phones, Android Auto and Apple CarPlay capability for compatible phones, advanced voice recognition, in-vehicle apps, personalized profiles for infotainment and vehicle settings (STD), TRANSMISSION, 9-SPEED AUTOMATIC 9T50, ELECTRONICALLY-CONTROLLED WITH OVERDRIVE. Keyless Entry, Privacy Glass, Steering Wheel Controls, Alarm, Electronic Stability Control, Heated Mirrors, Bucket Seats. Reduced from $24,995. This Terrain is priced $2,300 below NADA Retail.